Protomartyr and mighty warrior of Christ our God, / you were victorious in battle and crowned with glory, holy Stephen. / You confounded the council of those who persecuted you, / beholding your Savior enthroned at the Father’s right hand. / Never cease praying that our souls may be saved! Podoben: “Today the Virgin...” / Yesterday the Master appeared in the flesh among us, / today His servant departs from the flesh. 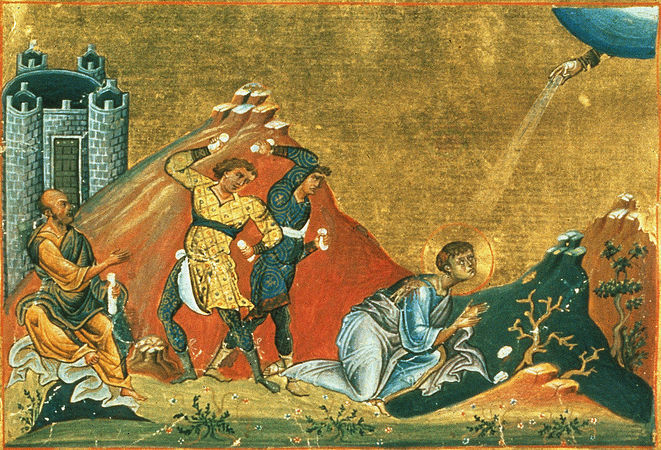 / Yesterday the King was born, / and today His servant is stoned to death; / for His sake, the divine Protomartyr Stephen is perfected through martyrdom.